Your Tuscany represents the most beautiful, private Tuscany villas: a refined selection of exclusive luxury villas in Tuscany with swimming pools, tastefully converted Tuscany farmhouses, farm holidays & cottages, as well as large group villa accomodations, and centrally located apartments in the city center of Florence. Finding the perfect accommodation can be difficult and time-consuming, Your Tuscany offers Online Booking and Real Time Availability to allow you the ease to book your vacation rental in Tuscany. Choosing your private villa in Tuscany for rent is just the beginning of your adventure! TUSCANY OFFERS! Book NOW and SAVE! Take advantage of special last minute deals and exclusive offers! Choose your Tuscan Villa from a selection of the best villas for rent in Tuscany on the web. Browse our portfolio and book online your personalized vacation rental in Tuscany. The best luxury villas in Tuscany, many with fully staffed service. Indulge yourself with an exclusively located luxury villa rental in Tuscany. From Forte de Marmi to Porto Ercole we have selected the most fascinating villas by the sea for your holiday rental in the Tuscan seaside. Book online your apartment farmhouse in Tuscany. Enjoy the local products and culture of a real Tuscan farmhouse lifestyle. From our fine selection of luxury apartments in Florence, choose a long or short stay vacation rental in the historical center of Florence. Enjoy five star service during your vacation in Tuscany. Your wish is our command: Tickects to your favorite museum, private and customized tours, and even a meal prepared by an exquisite private chef. Book online now your AVIS car rental through the Your Tuscany website and take advantage of the special fares we have negotiated. Thinking of getting married in Tuscany? Your Tuscany will provide you with a personal wedding planner to look after your every need and to make your Tuscan Wedding magical down to the very last detail. 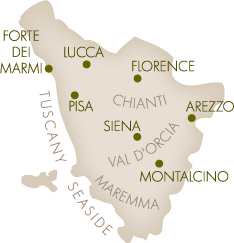 Get information on your upcoming holiday in Tuscany! Weather forecasts, sightseeing & recommended itineraries. YourTuscany Villas 4.7 on 5 92 reviews. WOULD YOU LIKE PERSONAL ADVICE ?